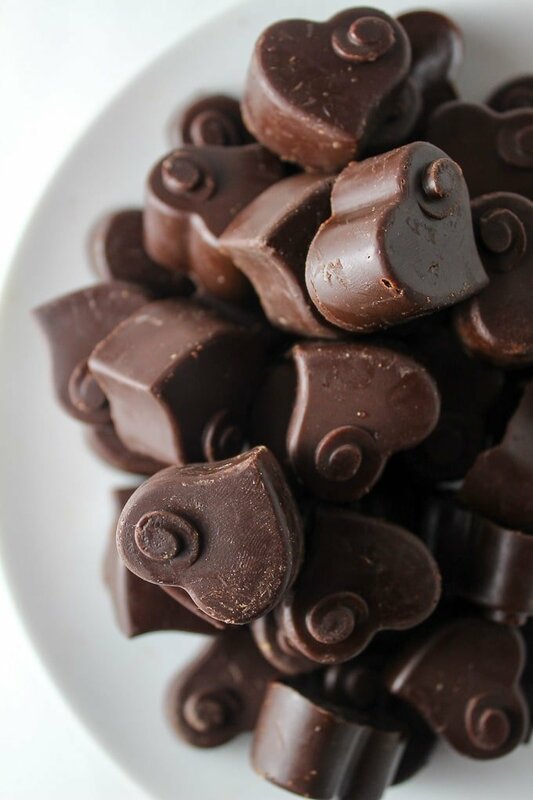 Easy homemade dark chocolate – only five ingredients! In case anyone actually needs another reason to reach for some chocolate….. The cocoa found in chocolate helps increase blood flow to the brain which leads to faster reaction time, better problem solving skills, and improved attention span. Not only that, but increased blood flow to the brain also improves short term memory and decreases mental decline in seniors. The flavonoids in chocolate help increase blood flow to the heart as well which helps to prevent blood clots and hardening of the arteries. Eating a small amount of dark chocolate a few times a week has also been shown to lower blood pressure. Quality dark chocolate, not the sugary kind, is full of antioxidants that have anti aging benefits to the skin. Not only that, but the same flavonoids that increase blood flow to the heart and brain also increase blood flow to the skin giving off a healthy glow. It’s a “joy stimulant”Cocoa boosts levels of serotonin and endorphins in the brain which leads to improved mood. So when you’re feeling down and you’re craving something sweet it’s likely the boost in serotonin that your body is really craving. 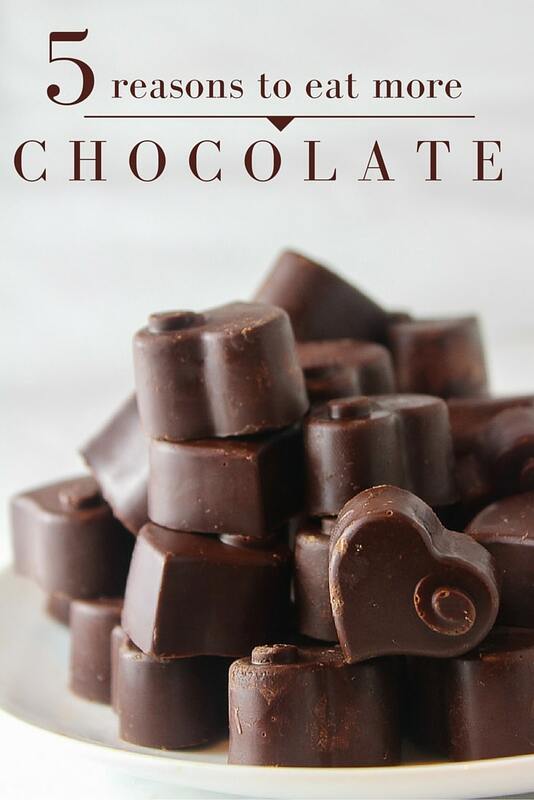 Chocolate is a great source of magnesium which has been dubbed “the original chill pill”. Getting more magnesium through diet leads to better sleep contributing to improved resilience to stress. Another study found that when test subjects who considered themselves to be highly stressed people ate an ounce and a half of dark chocolate a day for two week had a significant drop in stress hormones. Keep in mind that these health benefits relate to quality dark chocolate – at least more than 70% cocoa. Conventional chocolate bars filled with lots of sugar and additives don’t have the same benefits and are likely to cause more problems than anything else. Making homemade dark chocolate is probably easier than you think. It’s made with only 5 ingredients: cocoa powder (or cacao), coconut oil, honey, vanilla, and sea salt making it fairly easy to whip together. All you need is about 5 minutes of melting and whisking plus thirty minutes in the freezer and you’re good to go. If you follow this recipe as is you’ll end up with about 85% dark chocolate, but feel free to customize to your taste adding an extra tablespoon or so of honey. I never used to be a fan of dark chocolate but over time I learned to love it as my eating habits changed and I ate less sugar. Don’t be afraid to experiment with the flavors to make your own special chocolate bar. Add a teaspoon of ground ginger, a touch of orange zest, a sprinkle of chili flakes – whatever you like and make it your own. 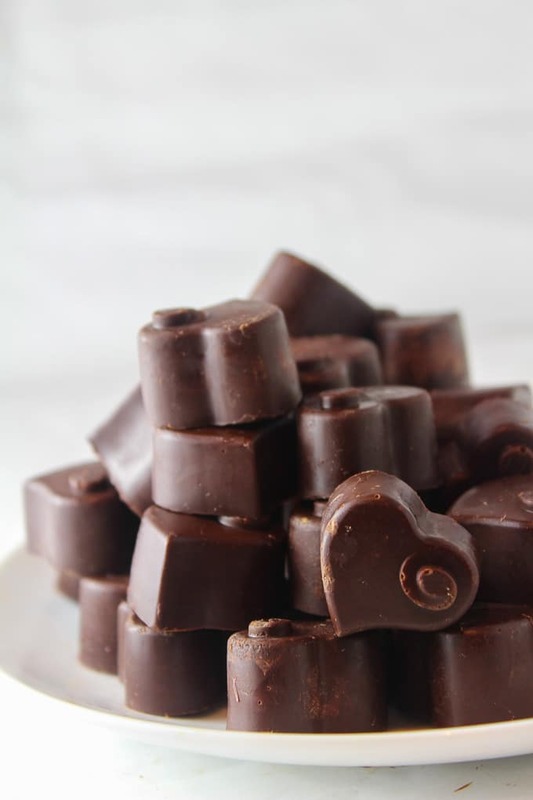 Easy homemade dark chocolate - only five ingredients! Begin by melting the coconut oil in a small pot over the stove top on a low heat. Once melted remove the oil from the heat and add the cocoa powder, honey, vanilla, sea salt and any additional flavors you want to add. Whisk everything completely until there are no remaining lumps of cocoa powder and the honey has dissolved into the chocolate mixture. Pour the chocolate into silicone molds or a lined baking pan and transfer to the freezer for at least 30 minutes or in the fridge for at least an hour. Once they've hardened pop them out of the molds and enjoy. You can also use cocoa butter in place of the coconut oil for a creamier chocolate. *If you're planning on using another extract like mint or almond use it in place of the vanilla. Thanks so much for the recipe and all the advice. I made some chocolate ganache using soya cream but it was a bit too loose and very bitter but I didn’t know how much stevia to add so probably used too little. Has anyone tried to using soya cream, or any other ingredient to reduce some of the bitterness? Great!!! Easy recipe. My fist try I had the oil to warm and it all separated into a gummy mess. So make sure the oil is just warm not hot. 2nd batch was fantastic, 10 servings lol. ( Not for me ) I made a solid bar as I have no molds. I just poured it on a parchment lined pan and sprinkled some course sea salt on the top. It came out of the freezer super shiney and professional looking. Thanks for this post!! Glad you liked it! Thanks for coming back to let me know what you thought! Hi Tamzin! I haven’t tried this out myself yet but I do believe that using cocoa butter in place of the coconut oil should stop it from melting so quickly! Coconut oil has such a low melting point it just doesn’t do well when warmed up but cocoa butter is much more lenient here. I am trying it today. Just a question though. If I am using cocobutter instead of coconut oil, Should I be using the same quantity of coco butter ? I’ve never made this using coconut butter but I do think it will work out pretty well – it will probably make for a really lovely texture! That being said, I can’t say for sure but I do think you should be able to use the same amount of coconut butter as you do coconut oil. Hope that helps! I Finally made it tdy. It was silky smooth. I used cocoa butter instead of coconut oil. And as u suggeated, i used the same qty as coconut oil. I just felt that it was a little more dark. But, my wife loved it, so I am happy. Thank you for your suggestions. Had you not put the receipy here I would have not known that its way too simple and delicious. Yay! Glad your wife enjoyed it! Thanks for letting me know what you thought! when I combine all the ingredients what temperature does it need to be on the candy thermometer when it is ready to pour into the molds. I have been having trouble getting it to combine and not separate. Hi Pat! I’m afraid I don’t know! At what stage are you having trouble with separating? I made these chocolates and they were good right out of the freezer. The next day the consistency was a little grainy. I used the amount of honey called for in the recipe and cocoa butter. Any ideas of why this would happen? Hi Nancy! How was it stored in the fridge? Sometimes if the extra moisture in the fridge causes the chocolate to seize which is what makes it grainy. Next time (if you hadn’t already) try storing the chocolate in an airtight container/making sure it’s properly sealed and that might help! Great recipe!. Only issue is that the chocolate, although firm to the touch after 1/2 hour in freezer and 3/4 of an hour in the refrigerator, gets on one’s fingers when handling. It has perfect taste. Any suggestions to solve the melting of chocolate in fingers? Also if important, I only heated the refined coconut till it melted and sligtly warm before mixing the chocolate powder, honey etc. Also I did not add the pinch of salt. Hi Roy – so glad you liked it! Unfortunately the nature of making homemade chocolate like this without using cocoa butter/typical chocolate equipment it’s almost impossible to make a chocolate that won’t melt easily in your hands. Sorry I couldn’t be more help here! Hi Sarah, I had tried a similar recipe once but without vanilla essence and sea salt. However, the chocolate smelt a lot like coconut oil which made it very untempting even though it froze well. How should I reduce the smell of that coconut oil? Also, is it ok to use iodised table salt instead of sea salt? Please for reply. Thanks in advance. As for the salt – iodised table salt is totally fine to use here if you prefer! Hope this helps! Hi Sarah – how should these be stored? In the fridge would be best! I melted the coconut oil. Then added the ingredients. Looked great. then suddenly, started turning to a gummy like consistency and I couldn’t whisk any more, I tried remelting, but of course it wouldn’t and only the coconut oil melted off the side. I ate a bit when it was in this state, it was like chewing gum chocolate, but wasn’t great at all. I left in the fridge and each day it did got better but not quit like dark chocolate. What did I do wrong, any advise? Oh no! The only thing I can think of is maybe the heat was too high when incorporating the remaining ingredients which caused it to kind of burn up. Has anyone tried this recipe with Splenda? I use stevia. Splenda should work. Hi Libby! Olive oil won’t work for this in place of the coconut entirely because the coconut oil is what makes this solidify when cold. I’ve seen olive oil infused dark chocolate before so there might be a way of adding some olive oil if you’re looking for a certain flavour, but I’m not sure sure how much you would need before the chocolate no longer works. Wish I could be more help here! What modifications do I have to do to the recipe to make it around 75% dark chocolate instead of 85%? the icing sugar is not dissolving in the coconut oil .. what should I do ?? and what happens if we use alkaline cocoa powder instead of unprocessed one ?? Hi Azzy! I think maybe you just need to keep stirring it a little longer – sometimes it just takes a little more time but icing sugar should absolutely dissolve in warm, melted coconut oil. As for the alkaline cocoa powder that’s totally fine! I specify using an unprocessed one since more of my readers are interested in paleo recipes but alkaline cocoa powder will work just fine! Where did you get your heart-shaped mold? Can you post a link? Hi Emily! I can’t find the exact mold because it’s been a few years but these ones are almost identical https://www.amazon.com/Webake-Silicone-Chocolate-Molds-Cavity/dp/B01GYL3I5W/ref=sr_1_6?ie=UTF8&qid=1531167924&sr=8-6&keywords=chocolate+heart+molds&dpID=51S1Blfl29L&preST=_SY300_QL70_&dpSrc=srch Hope that helps! Hi , thanks for the recipe!! Can I use Rice bran oil instead of Coconut oil, because the chocolate has a taste of coconut oil apart from cocoa. Hi Joel! I wouldn’t recommend rice bran oil because the chocolate wouldn’t solidify at room temperature. You could use palm shortening or even cocoa butter instead though and those should both work! I will admit it, I have a problem. I am a 3-4 bar a week addict of the 85% Lindt Extra Dark Chocolate bars. It gets to be expensive to support my habit. haha I’m looking at buying the candy bar silicone molds off Amazon. For this recipe, would you suggest the 2 pack of the 3 oz or the 6.6 oz size? Thanks Sindy! So happy you liked it! Totally understand the sweetness too – using powdered sugar is a great tip because it doesn’t have as distinct a flavour as honey or maple but still adds a nice sweetness. Thanks so much for coming back to let me know what you thought! That’s no problem! I just suggest melting since I know a lot of Americans don’t use kitchen scales – it’s easier to measure in liquid form. Just do everything as you normally would – you’ll still need to warm everything up over the stove top to help dissolve the sweetener. Hope you like it! I don’t smell it, but it’s possible that I’m more used to coconut oil now. I’m pretty sure the cocoa/cacao powder is the main smell though. Hope that helps! This is such a simple great tasting recipe. I used cocoa butter because I wanted to be able to keep the chocolate out of the fridge plus I wanted that extra taste that comes from the cocoa butter. I baked it into some choc chunk cookies and it worked great. Just about everyone who tasted it likes it and they’re amazed that it’s homemade. I only added 3 Tbsp of honey as I wanted a semi-sweet taste; I just tasted it before adding and went from there. That’s so great – I’m glad you liked it! Thanks for coming back to leave a comment/review! Glad you found it helpful! Hope you enjoy the recipe! Chocolates Are So Yum That No One Needs No Reason To Eat B’coz There Is No Fixed Time When To Eat Chocolates… Eat Chocolates Every Hour Whenever U Feel STRESSED Eat Chocolates B’coz Reverse Of STRESSED Is DESSERTS…… Be Happy And Eat Chocolates…. Yum! I love chocolate and these look so good! Thanks for sharing! Whoa! I never thought one can make such a scrumptious looking candy at home! Especially with 5 ingredients. I am pinning this recipe for later. This is an awesome post! Thanks for sharing the recipe. How Is this dark chocolate if the coca being used it’s just regular cocoa? To make it dark chocolate wouldn’t you use the dark chocolate cocoa? Just wondering cause I love dark chocolate lol!! These do look really yummy either way. Thanks!! Ahh sorry! I should have specified that more. Usually unprocessed cocoa powder (at least to my understand) means there are no added sugars which would make it dark chocolate. I’ll add that note in the recipe. Thanks for pointing that out to me! You don’t have to convince me to eat more dark chocolate! These look divine! I’m always surprised looking on the ingredient list of some chocolate bars what’s hiding inside. I don’t know why I’ve never tried making my own. Now I have a recipe to try! And more good reasons to do it. 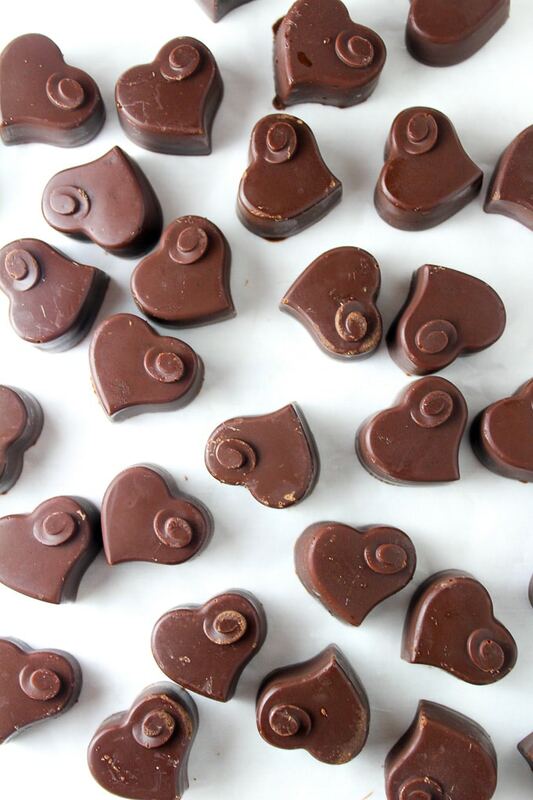 Your chocolate hearts look amazing! Where did you get the molds? Wow. I always assumed making chocolate (or any kind of candy) was really complicated! I could go absolutely berserk buying all different kinds of molds. This is exciting! Also, love that about the skin…I’m so vain! Me too! For some reason the thought of it really intimidated me – I always thought chocolate would be fussy to make. Even more reason to have it all the time now that I know how quick I can get it in the fridge 😉 Thanks, Christine! I love this mold! I have made chocolates a few times and it is a nice Saturday project with a friend. Love that as a Saturday friend date idea! These chocolates look store bought they are so perfect. They are so pretty. Love being able to add flavors to them like the chili flakes. Hot and sweet sounds great. Thanks, Ali! I love chocolate and chili together – you get the best of both worlds!